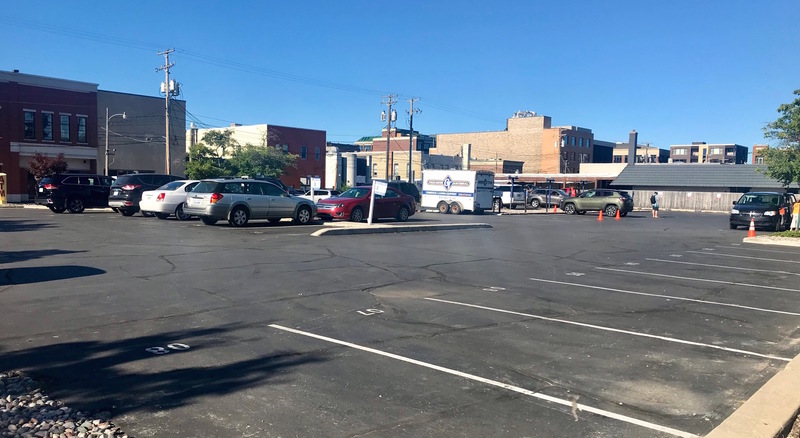 Rotary Charities has awarded a grant of $1 million to the Traverse City Downtown Development Authority (DDA), which will be used to develop Rotary Square. Rotary Square will serve as a gathering space in the heart of downtown, transforming two connected parking lots at the northeast corner of Cass and State streets into a public plaza which will host social and cultural events year-round. “The Civic Square has been identified within the DDA Plan for over 25 years, and with Rotary’s Charities awarding this legacy project, the civic square will be a reality,” says DDA CEO Jean Derenzy. Rotary has invested for decades in spaces for celebration and education, from the Park Place and the State Theater to the construction of the Great Lakes Campus and Discovery Pier. Rotary Square will mark Rotary’s 100th year of service to the region and in part will celebrate J.T. Milliken, the first president of Rotary Club. “We are very proud of our 100-year legacy as the Rotary Club of Traverse City. We couldn’t imagine a better way to honor our history than to create a community asset in the old Milliken’s parking lot,” says Beth Karczewski, Chair of the Centennial Grant Committee, which had previously narrowed the options for the grant to two options. The DDA is committed to an ongoing, community-led design process that will allow citizens to decide how the civic square will be used now and in the future. In addition to providing casual space to share lunch with friends or read a book, proposed events include an ice-skating rink, Santa’s arrival, and art installations.